With decades of industry-leading innovation in technology and media, Tokyo-based conglomerate Sony has long been a household name around the world. Since 1991, the US branch of the company had been based out of its headquarters at 550 Madison Avenue in New York, with offices spread over 34 floors to include its various divisions: Sony Music Entertainment, Sony Pictures Entertainment, Sony Corporation of America, Sony/ATV Publishing, and Sony DADC, among others. In early 2016, Sony and its subgroups moved into a new space at 25 Madison Avenue, the site of a landmark 1920s Art Deco skyscraper. Set to occupy the top ten floors and roof of the historic building, the new headquarters gave Sony the chance to reconsider the ideals of its working environment and its corporate aesthetic. The result: a sprawling 570,000 square foot office built with ample opportunities for customization and a sense of visual coherence across its floors. Working with New York-based design firm STUDIOS Architecture and VVA Project Managers & Consultants, Sony selected the Knoll brand for its constellation of products, designers, and brands, which could together answer every possible design requirement. Knoll partnered with Arenson Office Furnishings to establish a comprehensive “kit of parts” that could be referenced throughout the project, allowing for slight variations based on the specific needs of executives and subdivisions. An eclectic assortment of furniture and materials from Knoll resulted in a layered office space that still maintained a sense of aesthetic unity. The breadth of the Knoll catalog—which include Knoll Office, KnollStudio, KnollTextiles, FilzFelt and Spinneybeck Leather—allowed for the creation of workstations, private offices, and ancillary spaces that all shared the underlying ethos of good design. In the move from its former headquarters, Sony made the transition from private offices and high-panel systems to an open plan design that took advantage of the building’s lofty interiors. As the new Sony headquarters was essentially an adaptive reuse project, the designers from STUDIOS Architecture had to address the qualities of the existing building fabric and make decisions to ensure that the workplace would answer to changing user requirements. universal framework of AutoStrada Applied Walls. Additionally, the Applied Walls provided the ability to mount storage and architectural elements specific to user needs. The accessible pricing and efficient configurations of Anchor™ storage and Calibre lateral files similarly answered the need for low-cost flexibility. 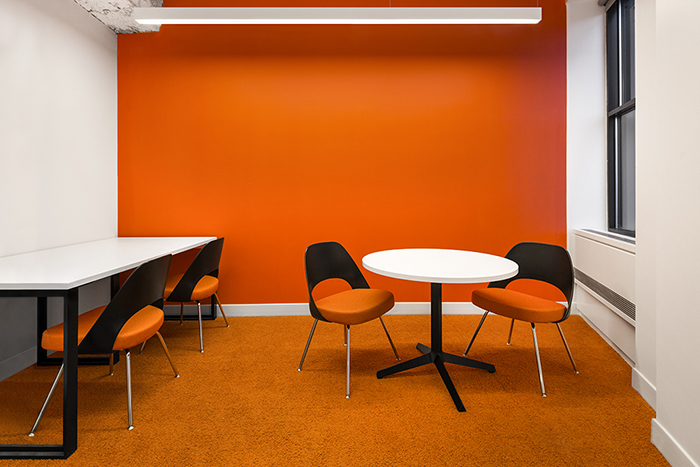 A pared-down palette for the entire headquarters allowed executives and internal divisions to select hues suited to their specific identities. Swathes of magenta, red, orange, and blue are carefully matched between Saarinen Executive Armless chairs and FilzFelt tackboards. Positioned in inviting enclaves, D’Urso Swivel Chairs and Barcelona Chairs, upholstered in KnollTextiles fabric and Spinneybeck leather, add texture to the office floors. By selecting the Knoll brand, Sony was able to craft a personalized space that speaks not only to the values of the corporation, but to the people and businesses that comprise it. Allowed executives to express their personalities using finish upgrades and Knoll designs. Created a future-proofed workspace built to accommodate changing user needs. Dealer: Arenson Office Furnishings, Inc.